However, writing an authentic and engaging blog requires more energy and work than what a simple (or even expanded) How-To can possibly help with. Well, if you’re so smart, say the How-To experts, how do you write an engaging blog, Hanna? Over the last few months, we’ve been exploring The 7 Habits of Extremely Engaging Bloggers. These habits encompass everything from how you organize your blogs to how you frame topics and what you do to make your blog “unique,” but the running theme that supports all of these habits is the importance of practicing awareness. Engaging blogs think for themselves. You must do your research to be aware of what thoughts you have about the topics in question. Engaging blogs seek to help their target audience. You must look into what you’re trying to “sell” with your blogging efforts and be more aware of how those products or services solve the problems your audience experiences. Engaging blogs are just so extra. You must take the time to slow down and get yourself aware of what you are saying and what you could be offering to provide more than just a blog post. All of this and more is achieved through practice and habit. Long story short, developing good habits while you plan and write your blogs will give you the tools you need to create blogs and topics that your audience will find interesting. As a blogger, you have the direct responsibility of linking companies and their audiences. You are the key representative, you are the avid researcher, you are the passionate nerd, you are the burly lumberjack (I don’t judge, I just consider options). You are the company, the writer and the audience blended into one voice. You must provide: the facts, the opinions, the pitch and the benefits (and probably more, sometimes). And, when you do your due diligence, your audience will thank you. They will understand what you stand for. They will relate to you. You, and you alone, are responsible for the clarity and context of your work. Do not write under the assumption that your audience will magically understand you. We must always be aware of our creations. Taking note of what the company needs to happen, what our audience needs to receive, and what ways we can revise and improve our writing to accommodate. Reach out to clients and ask for feedback. Make plans with them in mind. Take it upon yourself to reach out to attain the context you need, the information you want, and the direction that will push you further. I have a confession to make. This is one of my all-time favorite habits. Just kidding, they’re all my favorite. Everyone in the marketing world has said in one form or another, “blogging consistently is your ticket to online success.” While it’s completely true, blogging consistently will build your online presence and enhance your Google rankings over time, Habit 7 is hinting at more than just post frequency. We always talk about wanting our audience to trust us, but we don’t often consider how important it is that we trust them. Engagement is a trust exercise, I’ve beaten that notion to death by now, but it’s extremely important for us, as bloggers, to show that we trust our audience just as much (if not more) than we expect them to trust us. We might always begin a blogging campaign with heavy-handed keyword research, but blog engagement is more about creating a connection and becoming familiar with your target audience. It’s all about building that relationship through consistency, honesty, and authenticity. You must blog for more than just the rankings. Your bond with your audience, is dependent on your willingness to think forward. Consider what you’re sharing. Take a look at your opportunities. What are you not sharing that still needs to be said? One specific way you can practice this habit is by digging deeper into your resources when you review your past work. Don’t just look at your blogs alone. What is provided on your website? What else is missing? Are there items you can expound on? Are there separate posts that really should be blended together? Are there presentations you can add? Infographics? Videos? Blogs these days are more than just the words and research. We are the mighty few that can give marketing a soul, and make it about more than just the sales. 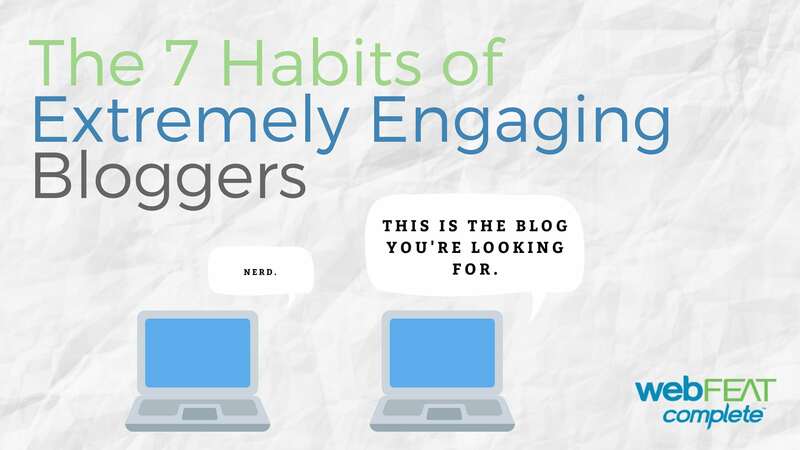 It’s a shame I only named 7 Habits of Extremely Engaging Bloggers. Because, really, there is no real end to these habits. We are all creatives, thinkers, analysts, designers, gurus and nerds, and we all have habits worth adding to this list. If you have any habits that you feel need to be added, please comment below or email me at hanna@webfeatcomplete.com. My goal is to continue this conversation, because there is no true “right” way to market yourself or your clients. We all need to keep the communication open and free to see where the best ideas could be. You, as a blogger, have the power to deepen understanding and relevance. You have the power to make a difference to your audience. You just have to get a little creative with what you have to work with.